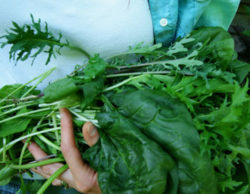 View cart “Lettuce, Crisp Mint Romaine (Lactuca sativa), packet of 200 seeds, organic” has been added to your cart. All our garden lettuces (Lactuca sativa) mixed together and then some! Planting this rich mix, you will find butterheads, romaines, heads and leaf lettuces of various colors, textures and yummy tastes. This is a good choice for row-cropping in the garden or field, or low-light growing in greenhouses and hoop houses. 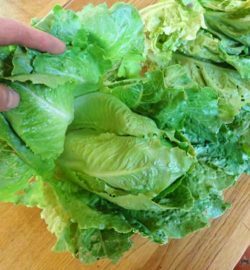 Cut and come again, home salad bowl or market salad mix, this is a very generous, high-germ, highly diverse mix of pure organic lettuce delight. Tender, colorful, a melody of tastes! Cultivation. 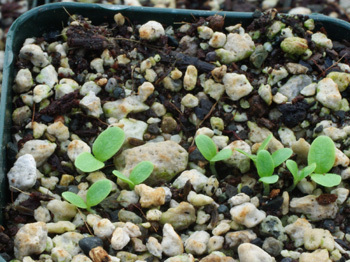 Make a shallow furrow, barely cover seeds and keep cool and evenly moist until germination. Thin to 3 inches apart, or allow to grow closely and cut to harvest. Remember, planting lettuce at cooler than 50 degrees F (10 degrees C) or hotter than 86 degrees F (30 degrees C) will give no results at all! 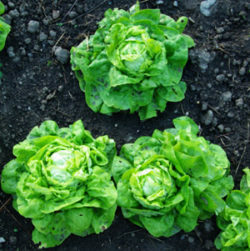 The ideal germination temperature for lettuce is 58 degrees F (20 degrees C).